Only 4 Elevation models left in stock! X31 OFF-ROAD PACKAGE includes Off-Road suspension (JHD) Hill Descent Control (NZZ) skid plates (K47) high-capacity air filter and X31 hard badge Includes (QAE) 275/60R20SL all-terrain blackwall tires (G80) locking differential and (NQH) 2-speed transfer case. Includes (N10) dual exhaust. With Incentives like these-- this one is hard to pass up! 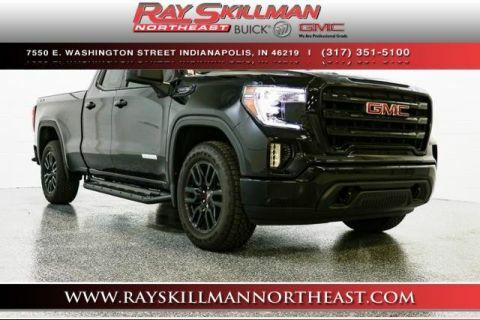 You will love driving this 2019GMCSierra 1500 with Standard features include: Bluetooth, Remote power door locks, Power windows with 4 one-touch, Automatic Transmission, 4-wheel ABS brakes, Compressor - Intercooled turbo, Air conditioning, Cruise control, Audio controls on steering wheel, Traction control - ABS and driveline, 5.3 liter V8 engine, Head airbags - Curtain 1st and 2nd row, Multi-function remote - Trunk/hatch/door/tailgate, remote engine start, Passenger Airbag, Power heated mirrors, 4 Doors, Four-wheel drive, Fuel economy EPA highway (mpg): 21 and EPA city (mpg): 15, Front fog/driving lights, Compass, External temperature display, Tachometer, Bed Length - 79.4 ', Clock - In-radio display, Cylinder Deactivation, Engine hour meter, Intermittent window wipers, Overhead console - Mini with storage, Pickup Bed Type - Regular, Privacy/tinted glass, Remote engine start, Self-leveling headlights - Self-leveling, Speed-proportional power steering, Split-bench rear seats, Stability control - With Anti-Roll, Transmission hill holder, Trip computer, Video Monitor Location - Front.... With our guaranteed approval program, you can drive home today in the style you deserve!